When opponents of the new Compo Beach bathroom failed to gather enough signatures to force a town referendum, construction near the pickleball courts seemed assured. But last night’s Planning & Zoning Commission meeting took an unexpected twist. Commissioner Chip Stephens began by noting that earlier in the day he was at South Beach. 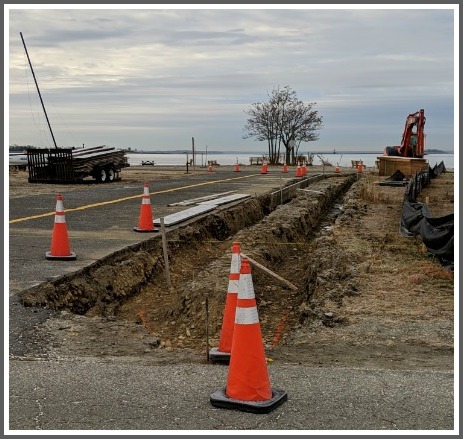 Construction has started on a walkway near the boat storage area — in the shortcut by the road that loops near the kayak launch. Last spring the P&Z approved the walkway, on the south side of the shortcut. But the contractors are working on the north side. They were given plans showing the walkway should go on the north. Stephens called it a “trivial” mistake. Things like that happen, he said. And often, the P&Z says (in effect) no big deal. Let’s move on. Stephens’ point was that the petitioners’ push to move the bathroom away from the pickleball courts is also “trivial.” He asked for a sense of the meeting saying (in effect) that if the Parks & Recreation Department decides now to move the bathroom, the P&Z will be flexible. There would be no need for months of deliberation, Stephens said. His recommendation was not an official agenda item. No action was taken. But one thing is certain: This post will get another 50 comments, as if it’s the most important issue facing the town.